Roberto Marcelo Levingston Laborda (January 10, 1920 – June 17, 2015) was an Argentine Army general who was President of Argentina from June 18, 1970 to March 22, 1971, during the Revolución Argentina period in Argentine history. Levingston was born in San Luis Province, and graduated from the Colegio Militar de la Nación in 1941. His military expertise included intelligence and counterinsurgency, and he took the presidency of Argentina in a military coup that deposed Juan Carlos Onganía over his ineffective response to the Montoneros and other guerillas. His regime was marked by a protectionist economic policy that did little to overcome the inflation and recession that the country was undergoing at the time, and by the imposition of the death penalty against terrorists and kidnappers. In response to renewed anti-government rioting in Córdoba and to the labor crisis under his leadership, he was deposed by another military junta led by Alejandro Lanusse. On 18 December 1943, Levingston married Betty Nelly Andrés (born 4 May 1926) and had two sons and one daughter, Roberto, Maria and Alberto. He died on June 17, 2015, at the age of 95. ^ Lentz, Harris M. (4 February 2014). "Heads of States and Governments Since 1945". Routledge. Retrieved 13 October 2017 – via Google Books. ^ Limited, Europa Publications (13 October 1990). "The International Who's who: 1990-91". Europa Publications Limited. Retrieved 13 October 2017 – via Google Books. ^ "Roberto Marcelo Levingston Laborda n. 10 Ene 1920 San Luis, San Luis, Argentina f. 17 Jun 2015 Buenos Aires, Argentina: Genealogía Familiar". Genealogiafamiliar.net. Retrieved 13 October 2017. ^ a b c Lewis, Daniel K. (2001), The History of Argentina, The Greenwood histories of the modern nations, Greenwood Publishing Group, pp. 134–135, ISBN 978-0-313-31256-4 . ^ a b c d Keen, Benjamin; Haynes, Keith (2008), A History of Latin America (8th ed. ), Cengage Learning, p. 374, ISBN 978-0-618-78318-2 . ^ "Bety Nelly Andrés Llana n. 4 May 1926 San Miguel, Bs. As., Argentina: Genealogía Familiar". Genealogiafamiliar.net. Retrieved 13 October 2017. This article article about the history of Argentina is a stub. You can help Wikipedia by expanding it. This article about an Argentine politician is a stub. You can help Wikipedia by expanding it. This biographical article related to the Argentine military is a stub. You can help Wikipedia by expanding it. 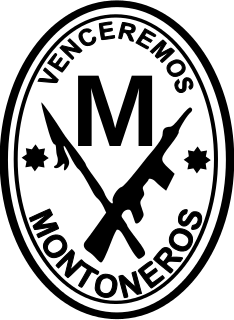 Montoneros was an Argentine leftist urban guerrilla group, active during the 1960s and 1970s. The name is an allusion to the 19th century cavalry militias, called Montoneras, who fought for the Partido Federal during the Argentine Civil Wars. The Argentine Football Association is the governing body of football in Argentina based in Buenos Aires. It organises the lower divisions of Argentine league system, including domestic cups Copa Argentina and Supercopa Argentina. The body also manages all the Argentina national teams, including the Senior, U-20, U-17 and Olympic squads. Secondly, it also organizes the amateur leagues for women, children, youth, futsal, and other local leagues, as well as the national women's team. The Citizens' Action Party is a center-left political party in Costa Rica. Club Atlético Vélez Sarsfield is an Argentine sports club based in Liniers, Buenos Aires. Its football team plays in Primera División, the highest level of the Argentine league system. Founded in 1910, the club has spent most of its history in the top tier of Argentine football. The club's home ground is the 49,540-capacity José Amalfitani stadium, where they have played since 1951. Cuyo is the name given to the wine-producing, mountainous area of central-west Argentina. Historically it comprised the provinces of San Juan, San Luis and Mendoza. The modern term New Cuyo indicates both Cuyo proper and the province of La Rioja. New Cuyo is a political and economic macroregion, but culturally La Rioja is part of the North-West rather than of Cuyo. The following is an alphabetical list of topics related to the Argentine Republic. 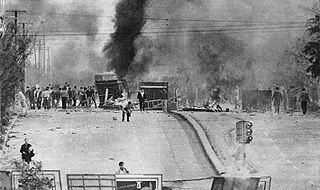 The Cordobazo was a civil uprising in the city of Córdoba, Argentina, at the end of May 1969, during the military dictatorship of General Juan Carlos Onganía, which occurred a few days after the Rosariazo, and a year after the French May '68. Contrary to previous protests, the Cordobazo did not correspond to previous struggles, headed by Marxist workers' leaders, but associated students and workers in the same struggle against the military government. Argentine Nation to the Valour in Combat Medal is the second highest military decoration given by the President of Argentina. Argentine Revolution was the name given by its leaders to a military coup d'état which overthrew the government of Argentina in June 1966 and began a period of military dictatorship by a junta from then until 1973. Alberto Carlos Taquini is an Argentine biochemist and academic whose "Taquini Plan" resulted in the decentralization of Argentina's public university system. Graduados is a 2012 Argentine telenovela that was broadcast by Telefe from March 12 to December 19. The plot concerns a group of people who graduated from high school in 1989 and reunite twenty years later. The main character, Andrés Goddzer, discovers that María Laura Falsini was pregnant in 1989 and married Pablo Catáneo, who thought that he was the child's father. The resulting parental dispute, the love triangle of the main characters and 1980s nostalgia are frequent plot elements, and story arcs related to school bullying and LGBT rights are also featured. The frequent flashbacks of the characters to their high-school days use the same actors, playing teenagers. Amador Vaz de Alpoim (1568–1617) was a Portuguese nobleman, who served as Officer of the Royal Armies, conquistador, colonizer and explorer of South America in the service of the Spanish Crown. He maintained an active military participation in the Río de la Plata, taking part in the military expeditions led by Hernandarias de Saavedra. Héctor Guillermo "Bony" Bullrich is a lawyer, aviator, entrepreneur and conceptual artist. In his first three years as an artist, Bullrich developed four projects: Free Zones, Neo-XVIII-ism, the art direction of "Alvear Fashion and Arts" and "Demonstrations over a red carpet".